with a quantity of marijuana in her bedroom two months ago. 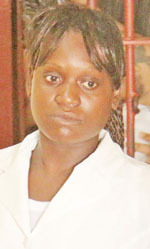 Shellon Hopkinson, who is pregnant, was caught with the drug by tipped-off police ranks that searched her Lot 55 Middle Street, McDoom, East Bank Demerara home on August 22, last. Inspector Joel Ricknauth who is prosecuting the case had said that the 21-year-old and her 4-year-old son were the only ones in the house at the time the drug was discovered. He said that the cannabis which was found in her bedroom was concealed in a transparent bag. After the find, the expectant mother pleaded with officers to give her a chance, he related. The prosecution explained that the 21-year-old was arrested and taken to the police station where the substance was tested and weighed. It amounted to 257 grammes. When Hopkinson first appeared in court on August 25, last, she pleaded not guilty to the drug trafficking charge and a trial subsequently got underway. The lengthy sentence was handed down by Magistrate Judy Latchman at the end of the trial at the Georgetown Magistrates’ Court yesterday. The Magistrate recalled the defence the young mother had led. Hopkinson had claimed that the police searched her bedroom while she was in the living room but didn’t find anything. The 21-year-old claimed that the charge instituted against her was trumped up. Ruling Magistrate Latchman said that she disbelieved that the charge was fabricated. The court had counted on the testimonies of the two police witnesses in the matter. She related that the ranks had told the court that they accompanied Hopkinson into her bedroom and saw a bulky leather bag lying on the bed. When they opened the bag, they said they found the illegal drug. The Magistrate said that Hopkinson clearly had control of the drug and based on her confession, there was no doubt that she had both knowledge and possession of it. Magistrate Latchman said that based on her confession that “I buy it fuh hussle” coupled with the amount, there was no doubt that it was intended for trafficking. During mitigation, Inspector Ricknauth revealed that there was no record of Hopkinson ever being charged or convicted. The 21-year-old said that she was not married but had a son and added that she is four months and two weeks along in her second pregnancy. “I never been involved in any other thing than this,” she told the court. Magistrate Latchman in her ruling said that she had considered the mitigating factors in Hopkinson’s favour as well as the quantity and street value of the drug which was $128,500. The Magistrate mulled over the seriousness and prevalence of drug trafficking in society. The court, she said, needed to act so as to prohibit others from contemplating to participate in the drug trade. A shocked Hopkinson was sentenced to prison and fined $385,500 – three times the street value of the drug. Hearing her punishment, Hopkinson gasped in disbelief and covered her mouth. She cried and hid her face all the way to the prisoners’ holding area.